Xbox One S is one of Microsoft’s latest offerings from its well-known range of gaming consoles which is designed to be lighter and smaller as well as created with video aficionados in mind. It is a revision of the original Xbox One hardware with a streamlined form factor. Its new casing is 40% smaller than the original design, and supports vertical orientation with a stand. Its size may be smaller but its controllers have been improved slightly to cater for 4k video output as well as some other changes in its structure. The capacitive power and eject keys were replaced by physical buttons, the side USB port and controller sync button were moved to the front of the console, and its power supply is integrated into the console's casing rather than sitting externally. Xbox One S requires a USB adapter to attach a Kinect sensor, as it no longer includes the proprietary port used on the original model. Not only does it gives you storage from 500GB to 2TB, but it allows you to play over 100 console exclusives and a growing library of Xbox 360 games. In addition, it's the only console with 4K Ultra HD Blu-ray, 4K video streaming, and HDR. The 2 TB model was released on August 2, 2016, and 1 TB and 500 GB models were released on August 23, 2016 and a Gears of War 4 special edition was also released. Microsoft seems to be going all out and putting pressure on its competitors in the UK! They are offering one of the cheapest in the current generation of gaming consoles through its Xbox One on a regular basis. 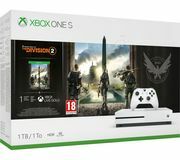 Huge retailers such as Tesco, Amazon, Argos and Currys are stocking some really cheap Xbox One deals either as a standalone purchases or bundles which are value packed with added games. Here at Latest Deals, we’re simply happy for our massive community of bargain hunters let the discounts roll in. For example, an Xbox One S 1TB deals on Game with Forza Horizon 3 + Hot Wheels + Playerunknown's Battlegrounds + Gears of War + NOW TV only costs £249.99. Now that's a hard deal to resist! Xbox one deals on Tesco includes great savings on consoles and bundles such as this Xbox One S 1TB Gears of War 4 Console Bundle which you can get for only £229.00. Not only will you get a huge savings of £70.00 but you’ll also earn 229 Clubcard points. Stocks are running out so make sure to act fast once you see a deal you really like. 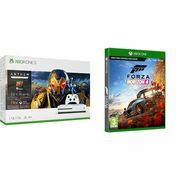 Currys offers Xbox one console deals bundled with games and accessories wherein you can save as much as £214.96 and a free 3 month subscription to Xbox Live Gold Membership. 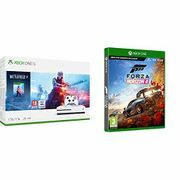 If you’re looking for accessories and games checkout Xbox One Sainsbury’s and Asda deals. You can get your favourite titles at great prices like Destiny 2 for only £21.00, that’s a whopping £25.00 discount at Sainsbury’s while you can now get Battlefield 1 at Asda for just £35 from £46. Xbox One Argos deals are the one to beat as well with their exclusive to Argos only Xbox One S 1TB Minecraft Limited Edition Console Bundle for only £249.99. This limited edition bundle features a custom designed grass block console and iconic green Creeper controller, Minecraft system sounds, and a vertical stand. This bundle includes a full-game download of Minecraft plus the Redstone Pack, a collection of unique skin packs. The upgrade of Xbox One S may not be that significant over the Xbox One but it still offers some really cool features and benefit like having access to HDR 4k Blu-ray supports which the PS4 Pro have unfortunately left out. However, in order to take advantage of these features you will need a remarkable 4KTV. Considering getting one though if you don’t own one already as it is worth it. Xbox One has been discontinued by Microsoft and the One X and One S are its main consoles currently. The price of One S has become cheaper significantly and you can even get bundles for as low as £199 and even lower during sales like Black Friday. When it comes to size, Xbox One S is considerably smaller compared to the original one, around 40% reduced to be exact making Xbox One looked really chunky at 333mm x 276mm x 78mm. Another edge of One S is the fact that it comes with a built-in power supply. There’s no doubt that one of the most standout feature of this gaming console is its 4k video playback support for streaming services like Amazon and Netflix as well as a 4K Ultra HD Blu-ray player. The starting price for this is around £249, which is an exceptional value if you will compare it to other dedicated Ultra HD consoles currently available on the market today. The original One may be capable of supporting 4k video and gaming, well technically that is. It features an HDMI 1.4a port, which means that its output is limited to only 4K at 30Hz. In addition, Xbox One S has a controller with a pad featuring a new texture grip, extended range and , exchangeable colour covers and most notably you now use it wirelessly with a PC as it has a Bluetooth. Where can I get a cheap PS4 Pro? What are the best deals for a Nintendo 3DS? Where can I get a discount on Xbox Live?